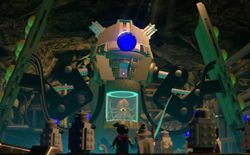 Dalek Emperor is a Doctor Who character who appears in LEGO Dimensions. Dalek Emperors are the leaders of the Dalek armies. They're enemies of The Doctor. One Dalek Emperor merged Dalek DNA with human DNA making the Daleks have human qualities and giving them a weak point. This page was last edited on 27 May 2016, at 20:51.